Advice for minimising stress and avoiding illness. If you're not careful, work and stress can lead to depression, anxiety and illness. 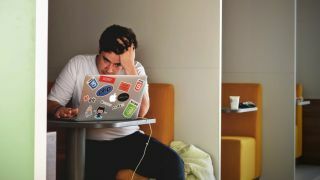 Sometimes we can get so caught up trying to build the perfect website layout or a wonderful user experience that we forget to take a step back and consider the impact all those extra hours working might have on our wellbeing. Three years ago, I was diagnosed with ulcerative colitis, and stress may well have been one of the contributing factors. After being in and out of hospital while trying to establish my career, I have learnt some painful lessons on how to manage stress. Here's my advice for protecting your health and wellbeing at work. First of all, the best thing to do is start talking. If you’re comfortable doing so, open up to your family, friends and colleagues. These are likely to be the people you spend most of your time with, so it’ll be helpful for them to understand what you’re going through. My partner and I talked about my illness regularly and it helped us get through it together. It may feel difficult to talk about (even with people you're close to), but remember you're not alone – in many cases there will be many, many others suffering from the same thing you are. Exhaustion is one of the main issues affecting professionals in the creative industries. While the occasional midnight flurry of coding isn’t going to kill you, don’t make it a habit. Always think: What’s the worst that’s going to happen while I have a few hours of sleep? Your health is more important than an extra line of code. Ensure you take some time to unwind. And by that, I don't mean just on your phone or in front of the TV (we’re all guilty of spending a bit too much time doing these things). Getting a good night’s sleep not only helps keep you healthy and well rested, it can also help you deal with stress. Simple tasks like keeping on top of bills, mowing the grass or fixing that leaking tap can also improve your wellbeing. Don’t feel like you have to tackle everything in one go; prioritise items that will make a difference to your life and your career. It’s better to do half of your tasks and do them well than to half-complete everything. Personally, I have been focusing on finding medication to keep my disease under control. Now I’m on something that works, I can turn my attention to my career. Discuss your illness with the person or team that deals with your welfare at work. If you need time off for your mental or physical health, then take it. There’s no shame in illness. Returning to work after an illness could mean that you encourage positive policy changes within your company. It also places you in a position to help establish new support networks and create a safe place for health-related discussions. Often in our industry, going the extra mile all the time is seen as important. It isn’t. Most of the time, putting in more hours causes more problems than it solves. Instead of working flat out, learn a new skill, take a stroll around your local park during your lunch break or help someone else. This will improve your creativity, productivity and help you get your tasks done more efficiently. Whether it's because of ridiculous traffic or delayed public transport, getting to work can often be quite stressful. But it doesn’t have to be. Often there’s no avoiding a commute, so make the time yours by listening to a playlist of your favourite songs, a podcast that inspires you, or reading a book you love. Use the time to prepare yourself for the day ahead or unwind as you travel home. Take a note of the situations that cause stress and how you react to them. Some people recommend keeping a stress diary, but not everybody has the time or commitment to do that. The main thing is to just be aware of what makes you stressed and how to turn the negative into something more manageable. Self-awareness is key. One of the toughest things for me was understanding that my illness is for life. When I was first told about it, I didn’t understand what the consequences were and how much of an impact it would have. Now I have taken a new view on my colitis: it won’t change me. I decided that my colitis won’t prevent me from achieving my goals and it won’t limit my ambitions. The only restrictions my illness gives me are the ones I put upon myself. If you focus on your health first, your career will follow. If you don’t feel well, your work isn’t going to be on top form either. Putting in ridiculous hours or working every weekend isn’t critical to success. The key is to prioritise your illness and focus on things that will positively impact you and your career. This article was originally published in net, the world's best-selling magazine for web designers and developers. Subscribe to net.